Yes, geeks rejoice on May the Fourth Be With You! Alas, her birthday does not fall on a weekend this year so the rebel forces are, well, forced to push it back a few to The Sith. Er, I mean the 6th. SO, the Emperor demands that you don your favorite Star Wars gear and arm yourself for this planet's shiggy and help Princess Money Shot and her co-hare, the dashing Captain Bindlestiff celebrate her celestial birthday in an epic hash space adventure to be known as the Star Wars Run! 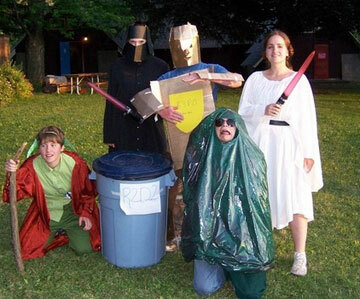 Dress as your favorite Star Wars character or wear Star Wars gear for prizes to be awarded at the on-in. Also, participation gimmees for ALL! ( hey, it's good to be the Emperor) At the very least, you have a Star Wars t-shirt, right? Get creative! C'mon, don't be a scruffy-looking nerf herder! Let's have some fun. Start will be at the "dock" side of Murphy Chandler Lake! Don't give us any bantha fodder, BE THERE! Bring usual hash stuff and a chair.